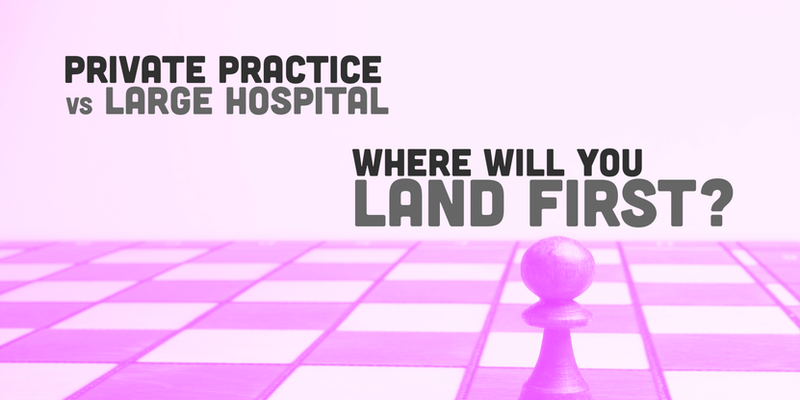 Private Practice vs. Large Hospital - Where Should a New Outpatient Physical Therapist Go? Congratulations! You’ve decided you want to work in outpatient physical therapy. That’s an important first step toward your five-year plan to establishing yourself as an expert in a particular area. The next, very important, step involves a crucial decision: Do you take a job at a private practice or a corporate giant? Private practice offers many unique benefits, including a more intimate, family-like environment. Therapists may have the option to help decorate the clinic, have a say in the music playing in the gym, and directly influence the treatment philosophies espoused at the clinic. However, it’s not all sunshine and roses in a private clinic. You may find yourself working extra hours “off the clock” to complete your paperwork. This is actually illegal, but a surprising number of private clinics have unspoken rules that therapists get their documentation done, yet overtime is not allowed. If you’re seeing 16-30 patients a day (many requiring tedious Medicare documentation), it can be very difficult to complete your documentation on time. Working for a corporate giant has its own set of perks and drawbacks. Strict employment laws mean you’ll likely receive break times and can expect to leave work within your scheduled shift (or at least receive pay for working overtime). Expect an enforced maximum number of patients you will be expected to treat during your workday, which limits therapist burnout. On the other hand, the work environment may feel stifling. Don’t expect to play gangsta rap in the gym in a major hospital, even if you only have one 20 year old patient in the gym. If you’re excited to launch a new program or teach a course, your ideas may take months (or longer) to be approved. Change is slow or non-existent at times, and this aspect of corporate life can lead to its own type of burnout in PTs. Furthermore, many large hospitals require a weekend or holiday commitment in the acute department every so often, regardless of what type of PT setting you’re in. If you’re not into acute, this could be a deal-breaker. Whether you opt for a job at a large corporation or a smaller private practice, you first few years will be pivotal to your career. Make sure you focus on the positives, learn as much as possible, and, most importantly, have fun!